If there were a sixth love language or even another valid currency, we're pretty sure it would be cookies. From classic chocolate chip to trendy macarons, everyone can claim a favorite for their preferred little crunchy or chewy treat. To celebrate National Cookie Month, we have gathered up the tastiest cookie inspiration from around the web that you can use for your own wedding-related celebrations! Or if nothing else, it'll probably have you preheating the oven to bake your very own. Either way, today's bound to have a sweet ending! 1. One of Tidewater and Tulle's most popular posts is a modern cat-inspired bridal shower, and so we're still drooling over the cuteness that is kitties with bow ties sugar cookies. It's enough whimsy for a chic cat lady celebration! 2. A cookie exchange bridesmaid luncheon?! Seriously sign us up! While this celebration amongst friends on Hill City Bride is wintry in spirit, this would be perfect any time of year. 3. One big trend in the wedding world right now are bridesmaid proposal boxes or specialty cards sent to the favorite ladies. But how about a cookie spin on it? These beautiful interactive "Will You Be My Bridesmaid?" sugar cookies on Belle The Magazine are totally on point! 4. These pretty watercolor pastel cookies on Marry Me Tampa Bay are almost too pretty to eat. Just almost. We'll take five, please. 5. What cookie artists cane do with some dough and sugar continues to astound us! We're absolutely obsessed with these gorgeous Spanish tile sugar cookies that serve as place cards for wedding guests on Calgary Bride! Breathtaking AND edible? Swoon to our eyes and tastebuds. 6. Pretty sure we're all going to want to move to Pittsburgh after learning that they have a Pittsburgh Cookie Tradition at their local weddings. Learn all about this sweet wedding tradition on Burgh Brides. 7. Honey shortbread cookies never looked so cute! This cheerful owl-inspired shortbread recipe on The Wedding Scoop is just what your wedding dessert table needs! 8. Engaged? 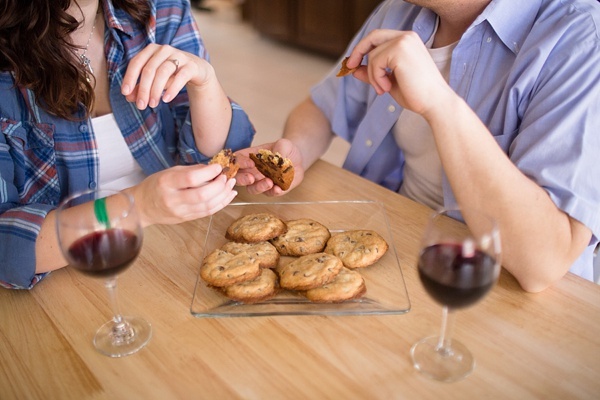 Why not have a chocolate chip cookie baking photo session like this one here on Tidewater and Tulle with your future spouse? It makes for some sweet photos and fun memories! 9. These adorable "All You Need is Love and our Favorite Cookie" cookie wedding favor bags on Etsy are the perfect touch if you're having a cookie bar on the big day! 10. And we just wouldn't be wedding people if we didn't mention the popular French meringue cookie cousin called macarons! These sweet little painted treats on Burnett's Boards are gorgeously detailed for any garden-inspired bridal shower or wedding day. Have some of your own sweet ideas to share? Post a comment to inspire! Photography by Andrew and Tianna Photography. See the full baking inspired engagement feature on Tidewater and Tulle. Some of the above links are affiliate-connected and purchasing through these links helps support future blog projects. You can find our full affiliate disclosure policy here on Tidewater and Tulle.